Enter For A Chance To Win Run Of Engagement Pass To See BEIRUT in Dallas. Caught in the crossfires of civil war, CIA operatives (Rosamund Pike, Dean Norris) must send a former U.S. diplomat (Jon Hamm) to Beirut to negotiate for the life of a friend he left behind. 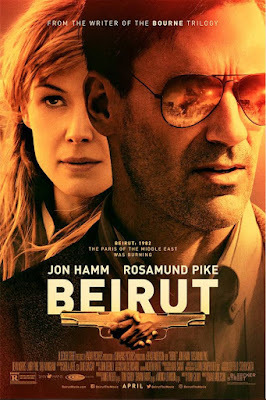 Beirut stars Jon Hamm (“Mad Men,” Baby Driver), Rosamund Pike (Gone Girl, Hostiles), Dean Norris (“Breaking Bad,” “Under the Dome”), Mark Pellegrino (Capote, Mulholland Drive), Larry Pine (Vanya on 42nd Street, The Grand Budapest Hotel), Shea Whigham (American Hustle, Take Shelter), Alon Moni Aboutboul (The Dark Knight Rises, Body of Lies), Idir Chender (Carbone, Occidental) and Jonny Coyne (Nightcrawler, Gangster Squad). Directed by Brad Anderson (The Machinist, “The Wire”). Written by Tony Gilroy (The Bourne Identity, Michael Clayton). Produced by Mike Weber (Jumanji: Welcome to the Jungle, Spring Breakers), Tony Gilroy, Shivani Rawat (Trumbo, Captain Fantastic) and Monica Levinson (Captain Fantastic, Borat). Executive producers are Ted Field (The Last Samurai, Runaway Bride) and Steven Saeta (The Island, Spider-Man).